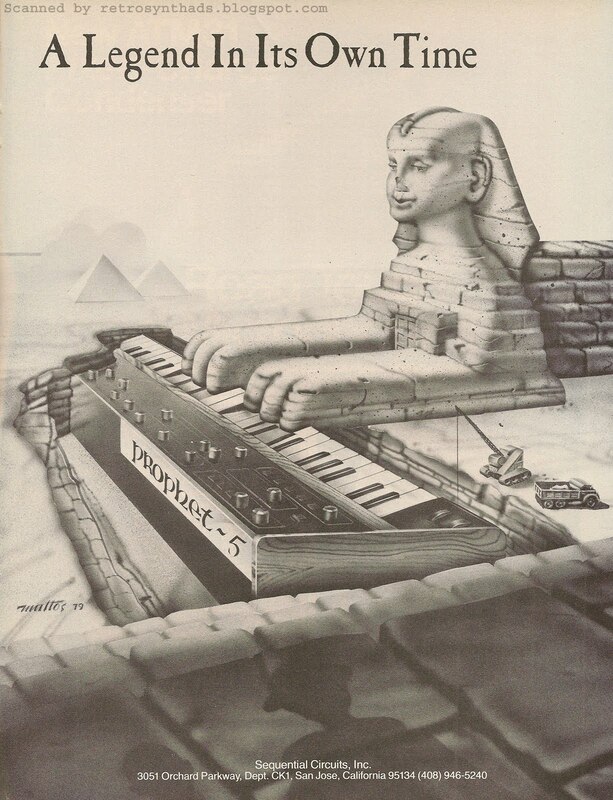 Sequential Circuits Inc. Prophet-5 "A Legend In Its Own Time" advertisement from page 41 in Contemporary Keyboard Magazine January 1980. This advertisement first appeared in CK around January 1980 and continued to run in many issues of CK throughout the first half of the 1980. My last blog post featured the first SCI ad that included artwork by John Mattos, and this ad is the second. Both ads are for the Prophet-5, but that is where the similarities between the two ads end. That first ad was a two-pager, full of colour, and included more than a mouthful of ad-copy. This second ad is exactly the opposite. Half the size, black and white, and... absolutely NO ad-copy. Taking a page from Moog's marketing strategy, SCI chose to let the Prophet-5's already legendary status pretty much speak for itself through Mattos's artwork. Actually, there is one other similarity between that first Mattos ad and this one. The address at the bottom changed in later versions. From 3051 Orchard Parkway to 3051 North First Street. I pointed this out in the last blog post, although I have no idea why I'm so infatuated with this small historical detail. Just 'cause, I guess. But, I can tell you why I'm infatuated with John Mattos. I first became a fan with the Ear*Force ads that included his artwork (see last blog post for a few links). Ads that were turned into a series of posters and other promo material. And he was also mentioned as the artist who airbrushed the updated version of the Sequential logo to create a 3D look with ruby lettering that was used in many other advertisements like this one. And this earlier artwork doesn't disappoint either. As they say, its all in the details, and two things in particular help make this ad stand out. The first is the tiny crane and dump truck. Perfect in helping put the size of the Sphinx and Prophet-5 in perspective. It also provides a bit of humor and personality as well. The second is the shadow of the shoulders and head of a man with the hat and his companion at the bottom (front?) of the ad. Its almost like, suddenly, you the reader, are transported directly into the shoes of an archeologist, looking on as the Prophet-5 is unearthed. And together, those two pieces help place the whole scene directly into the present time.